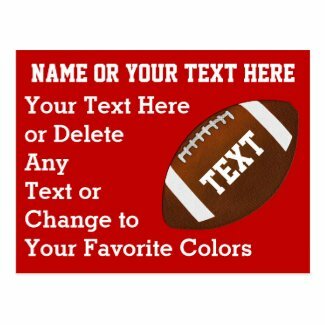 Cool and Unique Personalized Football Party Posters YOUR COLORS and TEXT. Call Linda if you would like me to customize it for you or HELP you personalize your Football Team Poster. 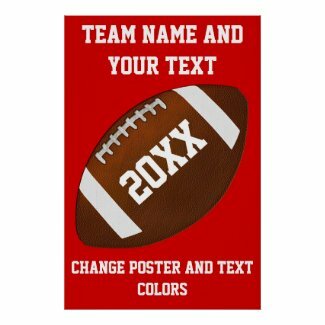 Instructions to change the Red Football Poster background color and the White text color are in the design description area, scroll down under the product and it’s descriptions. You can give these to all of the players personalized for each and every player, personalized one football poster at at time. Shown is the Large but you can choose from several different standard sizes or create your own football posters size. 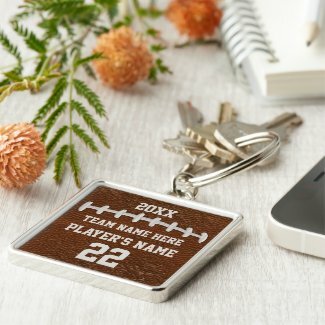 Personalized Senior Night Football Gift Ideas for Football Players. Personalized Football Gifts for Senior Players will be a memory they will keep forever. I put Instructions within the Design Description area on how to change the text and backgrounds colors to your football team colors. You can also contact me, Little Linda Pinda: 239-949-9090. 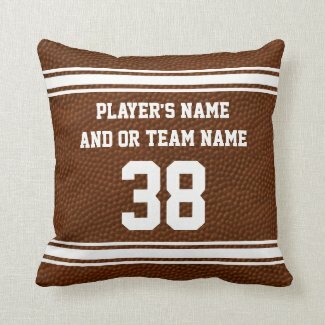 Some of the personalized football gifts have football BULK discounts too or you can just buy One. Call Linda here: 239-949-9090. I just created this super cool over printed personalized football jersey for men and older boys. It has a rustic old football texture and dirty football stitches. Type in their Jersey NUMBER or MONOGRAM or you can also just delete the text. The perfect gift idea for Senior Night Football Gift Ideas. 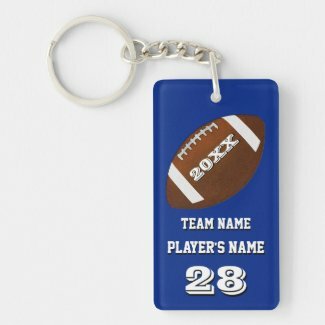 If you like this design and would like me to place it on another Zazzle personalizable gifts, please feel free to call me, Linda: 239-040-9090 These cool football players gifts will be cherish for years to come. One day, they will show their own children. I still have gifts that were given to me as a child and high school. Click on the Cheap Football Invitations (postcard style) and the matching Football Postage Stamps. Values will be updated as postage rates increase. Choose from several different first class stamp values in small, medium and large sizes. Call Linda to help you customize it or make changes. Linda: 239-949-9090. Invitations have lots of room to type in all of your football party information or delete any or all text. Choose Football Stamps denomination and size. Stamp values will increase as postage rates increase. Thank you for stopping by our Senior Night Football Gift Ideas article. 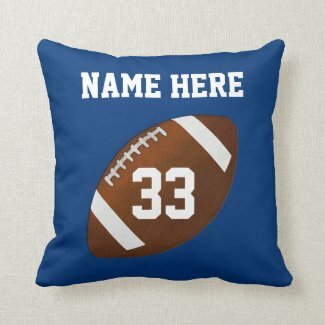 Please give Me, Linda, a call if you would like me to Change Any of the personalized football gifts for players and senior night football gift ideas to YOUR TEAM COLORS or special customization at no extra design costs. Please write “CONTACT” in all caps in subject line if you do email me. 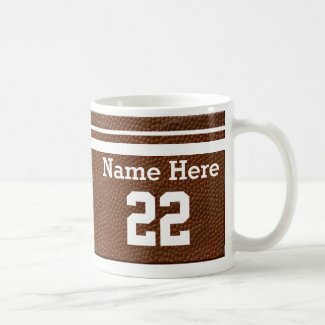 I get so many emails, I occasionally miss some..
We have lots of cool Senior Night Football Gift Ideas. Zazzle Designer Linda can change the colors and text templates to fit your needs. FREE custom designing service is offered by Little Linda Pinda on hundreds of customizable Zazzle products for everyone. This is a great way for your senior to remember the best year of high school. They will be able to remember all the times you were there cheering them on as they played football.